This entry was posted in Other Searchers and tagged Clues, Explore, Forrest Fenn, hidden treasure, Hike, Lana, Poem, thrill of the chase, Treasure Hunt, Vision Quest by dal. Bookmark the permalink. Yes, Diggin Gypsy, I’m very forthcoming as I really want that treasure found and if I can help someone find it in any little way that would be fantastic! Although I don’t know what we will all do once found…. That KOA in Dubois is a great place to camp. Our family took a treasure trip to Wyoming a few years back and stayed there a few nights before heading on into YNP. They call that area the “banana belt” of Wyoming…ring any bells? Lots of cool places to hike in and around Pavillion, WY too. Thanks for sharing Lana. I liked the way you tied things together. It is well known that Robert Redford had an excellent education and I think Mr. Fenn did also, perhaps in different ways though. Why did you go with Torrey Creek? Did you consider Jakey’s Fork/Fish Hatchery Rd? It seems like the right place once you are there and I believe Jakey’s Fork may be privately owned a lot of it. I admire your effort in examining literature to find hints for your solve. I hope that you find a treasure there. I recognized Brooks Lake and the Tetons in there too. It was a medley of places for sure. Lovely with many warm feelings emitted. Wonderful hand made flies. Thanks for sharing. I like your search area! I agree that there might be a Bighorn Sheep connection though I’m not sure its Whisky Creek. But, that is a good idea. I assume you know that Dubois is French for “The Wood”. I don’t think you mentioned that. You mention, “the chapter No Place for Biddies? On page 20 it reads: “the tall one was the best excuse I can think of for zero population growth.” I had not thought of Dubois as zero population growth, though now that you mention it. But, there is a better geographical feature near there that I think is a better fit. I agree that “Fenn took this book out of the trash and back on his shelf” is important. Equally important, IMO is that when the book was in the trash, it sat right on top of Time Magazine. I believe firmly that the Wind River is important. I think its “no paddle up your creek”. You can’t paddle up a river of wind. I think it is also tied to the jet stream. Just my opinion of course. Interesting that you looked up Hopalong Cassidy. I had not done that, but if I had then I would have seen another connection. I know you picked up on the Hopalong Cassidy mention. But, did you consider that it’s discused at the same time as the Daisy Air Rifle. In my opinion, the air rifle is a subtle hint to wind (Wind River). So you’ve got a subtle reference to Wind River (assuming I’m correct), a mention of Hopalong Cassidy. And one other thing- did anyone see it? Black Hats! You mentioned, ” 2 “warm” creeks that “halt” or slow down and change direction as they flow into the Wind River. . . ” One of those is Du Noir (The Black). Personally I don’t think its coincidence that these three things are mentioned in the same paragraph. I believe there is another subtle suggestion of Wind River on p 33 TTOTC. “When I walked to school on cold mornings, my path took me right past the pie factory on First Street and French (Du Noir and Dubois are both French names). It was hot inside by the stoves, so a giant fan would blow the aroma of fried pineapple pies (pinecones) right out there on the sidewalk in front of me.” I think those giant fans are the Wind River and the next statement mentions the “old gray-haired lady . . . ” (a subtle reference to Mother Nature). So where is the back door to Wind River? “I’d open the back door” p 33 TTOTC. I might know. So I’m right there with you on the connections to Dubois and DuNoir and Wind River. You lost me at HOB. I firmly believe that HOB is more of a metaphor. Either it is a natural fen area which literally is a home (independent ecosystem) made of brown soil-like substance or it is related to the sun in some way (sun as giant oven that “browns” everything). I really do like a lot of your ideas. I currently have three active solves going on and this area is one of them. You mentioned a few things I didn’t know. Hopefully I shared some things you can use. Actually, Dubois is translated “OF WOOD” as in a block of wood used to carve . Something to that effect. Thanks for sharing all of your research, Lana. There’s good research here, but the solve kind of diverges from all you need is the poem and a good map. Wow. Excellent work, and I’m looking forward to part 3! Excellent research and analyzing! I like how you’re put this together. Thank you for sharing. Looking forward to part 3. If I am remembering my research correctly. The Indian tribe of which you speak were known, as the Brown people. Can’t remember where I found this information though. I’ve thought for a long time that they may well be the “Brown “in the poem. Since I am Native American, Choctaw and Cherokee, I personally am not insulted when a term like “Brown people” is used. There may be something wrong with me. What I think is INSULTING is when some would like to change the name of the Washington Redskins. They stole our land and tried to wipe us out and now would like to erase the very memory of us. One of my very best, dearest friends is half Shoshone so I ran this by her before I posted it online to see what she thought. We agree that if you take color away from an artist such as Claude Monet to describe his great paintings you wouldn’t be left with much. Color eludes to feeling and emotions of warmth, cold, etc. Brown is a very warm feeling color. A beautiful natural color. You may have some good ideas, good luck!!! Lana is right about the way Fenn keeps alluding to all these other books, but then he says over and over again the only things you need to find the treasure is the poem and a good map. He says he has not intentionally introduced any red herrings into the hunt but he has unintentionally introduced several false clues. This may be one. Lana – This is a great potential solution. I love how you lean on “Important Literature” and try to find where all the lines cross. Good luck and looking forward to Part 3! One other thing you probably discovered in your Cassidy research, his first illegal act was a minor offense of stealing a pair of jeans and a PIE. When Cassidy was caught he wanted to pay for the stolen items but the store owner refused to give him a break and he was put in jail, which lead him to a life of crime. .
That’s cool. I thought it was a horse he stole but maybe I’m confusing that with the fact that Robert Leroy Parker had a horse ranch in Dubois. JDA, you are so right on how we all read things differently these days and, for me, always looking for a hint to pop out of any given work. As I recall, there are [wise] owls in the Torrey Creek glyphs. You betcha – the most owl glyphs in the world. Just a terrific report, btw; eagerly awaiting part III. Now, are you quite sure that it wasn’t in A Farewell to Arms where JD Salinger made the reference? aardvarkbark – Too funny. I am here in Sun Valley. The Community Library here manages the Hemingway House in Warm Springs. They just hosted the annual Hemingway Seminar last week, where WWI and A Farewell to Arms was the topic for three days. What did Forrest say about Ernest Hemingway, again??? I also explored Forrest’s potential connection to Bighorn Sheep and the Tukudeka in Yellowstone, and their Water Spirits. I found this trailhead for Sheep Creek online, then protected a herd of 30+ Bighorn Sheep on Highway 287 with my car on my way to the Grizzly Restaurant from Campfire Lodge. Got a pic of one of the biggest at a turnout near that spot on the way back. I think he was saying thanks. This area would be attractive, I think, to a 13 year old fishing guide exploring the views around the Madison River near his Summer home at the Fennhaven Cabins. And if you fish the Madison, beware of those Water Spirits, shown in several petroglyph images carved by the Tukudeka I found back then! They can take you down in the strong current. Lana – And that Sheep Creek Trail #216 leads up to Sheep Mountain and Sheep Lake. That’s next to the Coffin Lakes many have investigated, accessible by Watkins Creek next to the Firehole Ranch. If I weren’t so afraid of hiking in Grizz country alone, I would have hiked that trail up to the heart shaped Sheep Lake on that first boots on the ground trip in late July of 2013. Note: On that topo map, several ‘foot bridge” locations are marked to show where Trail #216 crosses Sheep Creek. I am pretty used to crossing rocky creeks in my trail runners with short wool tennis socks here in Idaho. But a 79-80 year old man like Forrest might have appreciated those foot bridges, while hiding the bronze chest. Especially with those Tukudeka Water Ghosts lurking. I wonder if there are any Water Ghost petroglyphs around those foot bridges crossing Sheep Creek? This pic was from those done by the Sheepeaters near Dubois. It’s on a private cattle ranch 30 feet from the road. Extraordinary! I snuck a peek really quickly! If you google Uncle Wiggily Petroglyph and Torrey Creek you will see a collection of glyphs at this location. I used his pics as a check off sheet and spied them all plus I found even more! What a fun place to search! Lana – Wow!!! Cool pics!!! I was actually referring to my new theory about there also being Water Ghost petraglyphs in the area of the Sheep Creek foot bridges near the Madison River and Hebgen Lake. Those bridges weren’t there, when the Tukudeka were crossing those creeks to hunt the Bighorn Sheep I saw crossing Highway 287 and heading that direction. 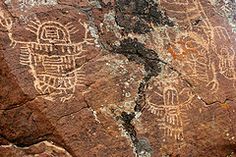 If the petroglyphs are, in fact, there, they probably served as a warning to hunters to avoid drowning in that Sheep Creek. Lana -Thanks for that info! Ah, but this expert doesn’t look for things the way I look for things!!! I will scout that Sheep Creek area in Montana someday, anyway. And now I have a great Nikon camera and lens to use, as of last week. So I can take great pics of the Water Ghost petroglyphs. And I even know how to turn the monitor around on the Nikon d5000 to do a selfie with the bronze chest, if it is there. Wink. Lana – And as to that “For Whom the Bell Tolls” vs. “A Farewell to Arms” title aberration by Forrest; maybe it was a nod to Eric Sloane? Lana – And maybe a tacit reference to Forrest surviving his service in the Air Force in Vietnam, and leaving the military, to do foundary work and then opening the Fenn Gallery in Santa Fe. And then meeting Eric through that gallery. And then writing several awesome non-fiction books, just like his friend and mentor, Eric Sloane, did. 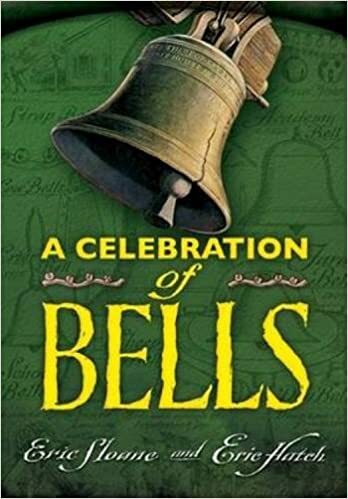 At one point I thought Fenn may have fastened one of his homemade bells someplace near the treasure so you could “hear me now and listen good”. I listened but did not hear LOL! There were so many other sounds in which to pay attention. Lana – Yes. I agree. I believe the ‘e’ in the spelling of ‘ dollers’ is a nod to Eric Sloane, also. That’s a small ‘e’. Kinda like Forrest signs stuff with a small ‘f’. To me, that symbolizes humility and gratitude for success. 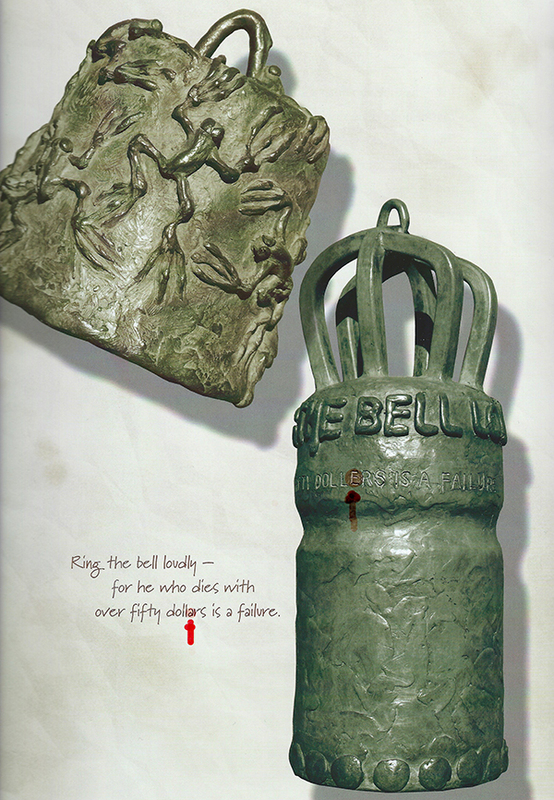 Lana – But also note that the text is in all caps on the bell itself. So that is a big ‘E’ for Eric, maybe. Forrest made a lot of money from Eric’s artwork at the Fenn Gallery. Mmmm yes. Also a bell “rings” and Ring Lake is right there. From Dubois to Torrey Creek gives me some trouble. More of a valley than a canyon, IMO. My husband has that same concern about it being a valley vs a canyon. He says the part near Thermopolis is a canyon with his huge steep walls. I agree with him, however, does f then say, “take it in the valley down” ? That might be more accurate for this particular solve, but then everyone would be looking in flat valleys and possibly dismiss this area. Ha ha – maybe it should be dismissed! From the canyon to Torrey Creek had me scratching my head too, as you change direction and course, but the poem speaks of a creek and it says “take it in the canyon down, not far but too far to walk” all in one sentence and since you walk after the canyon and it’s almost 10 miles perhaps this is why I believed in it (along with everything else that pointed me here). Just trying to find a place where WWH into a canyon is difficult even with all the thermal areas out there. You could have the same argument with the Firehole as at first WWWH near Ojo Caliente is not a steep canyon but then it becomes one near Madison Junction…..
Again , Hi Lana…..I really really admire the devotion. My only question, and please, use this as a positive thought , remember a child can find it…..now I don’t know if that means a child can “figure it out ” or be the one there to “find it “. Welcome to the club. The Canyon Down ? I would put money on the path being in a North West direction from Dubious Creek to Torrey Creek ,. Due W.N. Definitely a child could figure it out and find it. No problems there. From here it’s no place for the meek: I have no idea what a 3 year old would think of that, probably would need to be explained to them. 9. If you’ve been wise and found the blaze: good luck with the blaze, he already told you it’s a drawing now he ads an owl adjective to it with wise, Look quickly down: a kid could do that better than an adult since they are already closer to the ground bwa ha ha! You may be right Jeff, with “a child may have an advantage… better on sight searchers”. Have you searched with children? I tried to test that out every time I searched (5 times total) so I took my two teen boys (15 and 13 now, 2 years younger when I started) every time (as I couldn’t think of finding the treasure without the whole family being there) and though they both have 16/20 vision they didn’t see anything different, wait, maybe one saw an Osprey nest first but two more were found after that, not by them. They also didn’t have the staying power (got bored and distracted by hunger and the millions of cool rocks on the ground, etc. ), nor did they seem to be better searchers, turning over logs, etc., nor did they read and have the background info. I was searching all up and down pine trees for ceremonial embedded ram skulls, that kind of stuff, as well as arrowhead and artifacts on the ground, and getting a general lay of the land like Bridger. I also noticed, and was disappointed to find, that they didn’t seem to use their imaginations, but overall were more of a distraction to me as a mother. Had to go to the bathroom, one was cold due to the weather and from getting his feet and socks wet from fresh falling snow in the fall, a learning experience for him. There was also the spring trip where there were a million (no overstatement) freshly hatched mosquitos hovering over us following us around and into our car, like Pig Pen’s cloud in Snoopy that freaked them out even though we had enough deet and netting. Don’t forget when you are near the Wind River, there’s gonna be super strong wind too that can be a funny distraction to a kid whose not used to it (trying to lean into it and have it entirely hold your body up,having it push you around, letting golf discs fly erratically, you get it). Perhaps they were too old already, or just not into it? From my perspective they were more of a distraction to me by pulling me away from really setting my mind to work and grid searching as I needed to constantly address their needs. The kids were great fun in other non searching ways, for example, we have great memories of doing the “TRex crawl”, a dance with our arms to keep the skeeters away, the ginormous ice creams at Farson Mercantile shop we ate at 3 times (top 10 in the state of Wyoming), among other amazing memories. They were great in the Dubois museum and the Sheep Interpretive center and in the Cowboy Cafe, their sharp eyes did catch that the kids who were hunting (orange caps and camo) that were their age were carrying a real, live pistol at their sides – that was fascinating to them. So after all that, I still don’t see a younger child being interested for an hour or more, so I respectfully beg to differ that a child is going to be a better searcher. It’s a nice theory where I would LOVE to be proved wrong as I believe in the greatness of kids. I didn’t mention that their air fare and meals the couple times were flew took a chunk out of our wallets too. Teen boys can eat a lot! A couple trips of 15 hours each way in the car with good behavior was a lot to ask for fighting competitive brothers, kids these days who are too used to constant quick change like darn esports. Personally, if I did it again, I would bring a picnic, some beer to help me get in the mental state to Vision Quest perhaps, and my husband (he was a great supportive searcher, and no kids – LOL). I’d take my time searching with far fewer distractions, and when a break is finally needed, climb up on one of the boulders we named “beer rock” found to admire, and enjoy the view of the lakes, facing east like the Vision Quest Sheepeater’s, while eating my sandwich and sipping a cold one. It would be interesting to hear other people’s perspective on searching with kids, whether similar or not. I get the feeling many searchers do not have kids for whatever reason, maybe the kids are all grown up, or this search doesn’t draw the type of people who feel a need to have kids. And it’s late and I can see I’ve written TMI, so I apologize. Have a great search my friend. Where’s home Lana, what state? On at least 10 of my 23 searches, I have had my 3 (now 5) year old Great Grand daughter with me. She is an AVID searcher. She keeps encouraging us – Granpa you think it is over there? You think we will find it soon Granpa? LOVE that child. Just yesterday she was askin’ – When are we going treasure hunting again Nana? How cute! I call home the Sierra Nevada foothills of Northern California. Next time, maybe I’ll ask to take your grand daughter up there. Okay, now you’re scaring me a little (Ha! ), your children sound a lot like my 12 year old twins. They suffer from the texting device syndrome, and airfare, and lodging..whew! I’m with you 100% on that one. I like JDA’s great granddaughter. I wish she was coming with me to YNP in a few weeks. Are your twins boys? My boys are Fortnite addicts…it takes two of us to police their phones full time. We didn’t give our kids phones until last year while all the other kids got them in fourth grade at ages 9-10. It’s proven that their brains can’t handle impulse control and sadly, all the games have mastered the ways to keep kids coming back. It’s ruining a generation of kids…. Boy/Girl and yes boy is Fortnite addict but only allowed on weekends. I am optimistic regarding the twins for the upcoming BOTG but, mostly because I have taught them to fish and camp. Your post was a needed dose of reality. I may have to refine some of my BOTG planning. Best of luck to you on the chase. Aw Jeff you are gonna have a blast with them. Fishing and camping in YNP – you can’t go wrong. I recommend swimming in the Firehole River. Get on that one way canyon road around 10 am to get a good parking spot and spot on rocks near the water, and if your kids are strong swimmers you will LOVE IT!!! Refreshing and fantastic! CM Ranch owns the lower end of Jakey’s Fork as well as a couple parcels in the Torrey Creek area. CM is one of the oldest dude ranches in the area. Yep, I checked GIS often to double check property ownership. It’s always interested me that Forrest pitched that book into the trash. Or was that Dizzy Dean? Oh well, pretty sure it was Forrest. But I like your solve so far—can’t wait for part 3!! I’m so excited for you to read part 3 I’m biting off my fingernails! It makes so much sense to me. Lana, Really cool. Loved all the step-to-step connections, literary and otherwise. etc. Just curious as to how this solve could be deduced from the poem only. I just responded to someone on here and wrote it up from a 3 year old’s perspective. Check out that version. Very exciting! I have a nearby warm water halts. But up a different creek! I cant wsit till part 3! I agree, the Butch Cassidy book is very relevant to the chase. The Important Literature chapter as well as Jump starting the learning curve holds many clues. I believe f named those chapters as such for a reason..
I’m anxious to read part 3 but I can already see we have a different ending. Perhaps, if you’re done with this line of thinking we might collaborate on a different solve. We appear to have a similar way of deciphering the clues in the book. If you interested ask Dal for my email. All the chatter about other books lately reminded me of a SB… ya know… the one fenn repeatedly wrote ” my book ” and placed a date next to each reminder. And TTOTC book leads to the other books. .He as much as says so. My point was, is it possible to nail down one [ or eliminate of others ] book to figure out if “his” book to be the important book, line of thinking. What book does fenn consider “my book”? and ya have to wonder why that particular book. That’s why there’s so many different solves. Yep, I agree with your analysis of IL and JSLC chapters. F says you can find the treasure with a poem and a map…although no one has yet. No one can get past the first two clues with just those items….If you can’t, as I couldn’t, I tended to branch out and grab more bananas, so many I stuffed my pockets, socks, stuffed one in my mouth, and turned up the edge of my shirt to form a make shift basket so I could hold more. Perhaps I’ve opened up a can of worms in doing so, with the greater influx of info….only time will tell. I like to think I’m like Parzeval going to the library building in the movie Ready Player One. I only wish we had videos like that of Fenn to watch. That would be truly incredible. In part 3, at the end, I offer my contact info for private chatter as I’m trying to end the search and get my life back – ha ha ha. I think that the quote you mentioned, “Pg 23 ttotc, “if it weren’t for my name I wouldn’t have anything at all. No matter what I lacked or lost, bad grades and all. They couldn’t take away my name.” is a suggestion of a natural forest fen. I will likely be checking this area out next weekend! I’ve exhausted the Kirwin area and this seems like it would be a nice change of scenario! I’m only about 2 1/2 hours from that area. Go Cody! Bring her home!!! Usually I don’t get too excited when I read these solves posted on the blog, but this time I feel differently. Your references to the other books are interesting, but your observation that Forrest remarked in TTOTC about “A Farewell to Arms” and ascribed it to “For Whom the Bell Tolls” is totally stunning to me. I have read that chapter several times, and I admit that I never realized what he had done. So I wonder if he did it on purpose, or was it a complete mistake? If it was his intent to make the wrong comment, then it may indeed be a clue. However, if he did it unintentionally, it could be simply a mixing of memories between 2 Hemmingway novels. I just don’t know if I believe yet that it was intentional. I am also waiting for your PART 3. Great work here!! Thanks Franklin. I believe other people have noticed that as well about Farewell to Arms and For Whom The Bell Tolls. Part 3 is the best I think – with good, hopefully convincing pictures! As TSAL indicated, people figured out the deliberate (in my opinion) “screw up” between For Whom the Bell Tolls and A Farewell to Arms almost immediately after the book came out. Any searcher who was forced to read Hemingway in high school likely recognized that something was amiss. It’s a HUGELY important hint (imo): possibly one of the “good hints” to which Forrest referred. It is nothing short of crucial in my solution. That sounds like the Fenn I’ve gotten to know through his works. My father used to do that too so I’m very used to that. My Dad watched you intently after he said something incorrectly to see if you were thinking it through in your head and then if you realized it and lastly if you would actually call him on it. Sneaky and silly just like Fenn Ha Ha! I remember reading Fenn did that with a chief to be corrected and get more information out of him. Smart IMO. Once the poem’s nine clues have all been solved and the Tresure Chest along with the amazing biography of Forrest Fenn is housed at the Smithsonian along with relics and journals of other past great legends, there will be enough fodder from “solves” on this and other blogs to fill volumes upon volumes of “The Life And Times Of Forrest Fenn. I hope some day there will be a series that aires with great scenery of the Rocky Mountain, with a kindly old story teller somewhat akin to Will Geer playing Forrest telling stories of history, prehistory, Native American legends, and the natural history of the ” Backbone” of America. I would hope that my grand childrens children could watch reruns of The Life and times of Forrest Fenn the same as I relish watching Daniel Boone, Gunsmoke, The Big Valley….oh….and a movie called Against A Broken Sky….a great flick about hidden gold. I would only make one amendment that the chest travel between museums in the Rocky Mountains starting with the Buffalo Bill Center but otherwise I agree. Lana I cant wait to read your part 3. I think you may have some things figured out. One of my selves had to do with the Wind River area, but I put it aside for some reason that escapes me, but keep going. Thanks for your kind words. Perhaps you can continue where I left off and search this area? Perhaps. I will let you know. You are one bright lady and an astute treasure hunter. I’m excited to read your next piece. Oops! Commented in wrong place. How are we neighbors? Neighbors? How so? Home address or in where we have searched? Sorry. I’m bad at posting in the correct location. Lana and I have the same search area. And I now realize you are Lana!! I’m a goofball. Dal has my email if you’d like to hear about the similar connections I’ve made. You’ve shown here that Forrest Fenn has found a way to teach people where they actually want to learn. Professor Fenn! Yay Copper! I was wondering if I would ever find anyone searching or who has searched the same place. but i started thinking why was it said there are no structures associated with treasure ? then the museum is out of the occasion. and so is any structure. clue thinking it was a good day have fun be safe. dal did you drop a white rock? “and Eric Sloane’s Eighty (which actually also refers to Robert Redford’s book).” I don’t remember Eric referring to Redford’s book, just that he had bought a piece of Eric’s artwork from Forrest’s gallery that Eric had hoped to buy back himself. Also, Forrest has pointed out (not sure where) that Redford had played the Great Gatsby (1974). The downside of Robert Redford as part of the chase is that his brand is everywhere in the Rockies. You can even tie in Forest’s parents with Robert Redford with very little effort. Plus the associations with Brown’s park and Diamond Peak definitely gave CO searchers an extra kick. Overall I really liked your assessments of the books. In part because my middle school English teacher ruined them for me. Though I am curious what 30 minutes from a bridge would be in actual distance as that really rings of Forrest. Could be a reference to finding the edges as some of those books are still read in some schools. They’re all available to be read/taught in most US schools. Banned Books lists are usually compiled by *opponents* of book-banning by local school districts or libraries. They usually show where and why certain school boards have voted to restrict access to certain books. Banned Books Week 2018, coincidentally, is next week. It’s intended to celebrate education and freedom to read, and to challenge attempts to restrict access to books. This is a brief (and entertaining) intro to books banned in schools. Being on the banned book list make me want to read it more. Actually, I ordered a book off the banned list once I found out they others mentioned by Fenn were banned. Lana-I do believe we have to be careful in our interpretation of Forrest himself. I’m not sure his “soul is bruised” or that his father didn’t think him smart enough for college. There is quite a bit of humor and embellishment in his stories. The important literature books are critical. What he’s been able to accomplish is what very few academics can. He’s gotten us to “think critically” while reading and exploring at the same time. The person who understands his curriculum the best, and who can flesh out the hints from the hogwash, is probably the closest. We are all getting our PhD’s in Literature, American History, Archeology, Anthropoly, Geography, Geology, Fisheries, and Forestry. I hope I have the stuff to graduate. copper……..I’ll jump in here and whole-heartedly agree w/ you about the “educational” subjects delved into while attempting to decipher Mr. Fenn’s poem. Truly gives alot to be considered….. Linking clues to books or old tv shows I believe was not the intent of using books outside of the books F wrote trying to solve the poem. Again as I said with your part one, this leads to specialized knowledge. F did say that there were subtle hints in TTOTC, nothing was said about using other books to find the clues. I simply do not understand why folks are using books that were not written by F. This to me is creating way too many rabbit holes and unnecessary work. However again good use of imagination. I appreciate your concern to keep me on track. Thank you. Where did F say “subtle hints in TTOTC”? I don’t remember him naming the book title when he mentions hints in stories or chapters….this observation is what sent me down my rabbit holes. Ha! What better way to weed out searchers? The lazy ones get C’s, the ones who go over and beyond on the road less traveled get A’s? I’m totally guessing here. Since none of us appear to be the one who is certain and on the right path, I took liberties to read since I had the other stuff down and 3 years is a lot to spend on limited info. I wanted to get into F’s mind see where he was coming from, walk in his shoes as much as I could. Also, I used those extra info bits I felt he was hinting at us to read, to confirm my location. They also all point to Torrey Creek. Even all ATF comments f made. Read below and let me know if this works better for you. As far as imagination, all this stuff is in the books, I’m connecting dots, not making it up. That’s why I use so many quotes. Take Catcher in the Rye….I was reading it and found the word Yellowstone in reference to the NP. What are the odds of that?! What a clever way for Fenn to subtly lay a clue! I’m completely wrong too. But if I can get you thinking some way or get you to look at something differently so you can solve it, then hooray! I’ll be proud to be any little piece of help! 1. Begin it where WWH: Little Warm Springs Creek at the KOA where it enters the Wind River, test the water by sticking your hand in the Creek near the confluence, but on the LWSC side. 9. If you’ve been wise and found the blaze: good luck with the blaze, he already told you it’s a drawing now he ads an owl adjective to it with wise, Look quickly down: a kid could do that better than an adult since they are already closer to the ground. I did use hints, it should have said subtle clues, from pg 133. TTOTC. I understand the C’s & A’s, I tried hard to get A’s, but as I was reminded on several occasions from teachers and professors not to over think which leads at times to stray away from topics and brings around assumptions that is far from the suggested topics at the time of what is being taught. I never thought that what you presented from books was just imagination. The process on how you tied those books as a way to answer clues in the poem was good use of imagination. We all have different theories about a solution. F has said earlier in the year over at MW on Feb. 4, 2018 to “simplify”, to me means to not over think the process in solving the poem. I get it, that earlier on things where not going well. I sincerely do try to look at other’s solves and take into account with an open mind that my way isn’t the only way. Please don’t take me as being overly critical to you personally. Just keep at it until you find the TC or until someone has found it, then its “why didn’t I think of that”. I do appreciate that POV with the children that you found. I have to agree with CharlieM that using books not written by FF creates a lot of confusion. Even so, I am surprised that Lana found some connections in using those books that I had found using only FF’s book TTOTC. Personally, I think the quotes FF uses in Important Literature are subtle hints that can narrow down the location of the TC if you can make sense out of them. I think they truly are very very subtle.